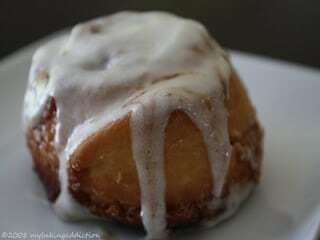 Last week I was on the search for cinnamon rolls that could be prepared at night and baked in the morning. 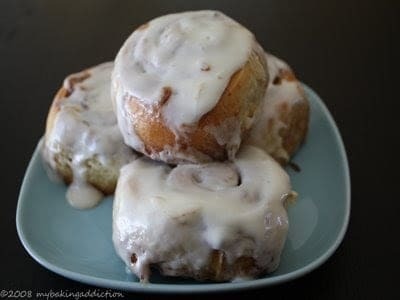 My search ended after a friend sent me the recipe for Alton Brown’s Overnight Cinnamon Rolls. I figured this recipe had to be fantastic as it was given many stellar reviews on the food network website. Well this recipe turned into a GIANT fiasco due to my own error. Amidst the easy preparation, I had a slightly dumb moment and subbed dry active yeast for rapid rise yeast…this was a BIG mistake! My beautiful ball of Alton Brown dough never doubled in size, hell it didn’t even rise a centimeter. I was quite perplexed until I fished through the trash can and discovered my error. To say the least, I was pissed and chucked the dough in the trash, hung up my apron (side note- not really I don’t wear an apron, it just sounded good to me) and went to bed. Fast forward 24 hours and I was attempting to make this again! All went well except for the fact that I had no time to photograph all the gooey goodness, hence no blog post until now which means in one week I have made this recipe 3 times…yes, 3 times…now that is some dedication people (and one long sentence)! Okay now for the review after all that mindless rambling…these things are fantastic…super easy (just pay a little more attention than I did) and delicious. If ya missed this Alton Brown episode, check it out on youtube by clicking here. If you want the recipe, clickity click here. Oh and if this post got you thinking of aprons as opposed to cinnamon rolls, click here for some exceptionally adorable ones by Sommer Designs. Enjoy! alton brown really knows what he’s doing, and so do you–these look incredible. I just tried these too for the first time the other day. They’re fabulous! Have you tried making this without the help from the stand-up mixer? I don't have the equipment and was wondering if I could do this by kneading it, and if so, do you know for how long? Thanks for your inputs! Thanks for posting! I made Alton’s 2 years ago for Xmas morning and I too had disastrous results. I think I made a mistake with the yeast also. This past Xmas my 9 year old daughter told me just to buy Pilsbury cinnamon rolls – ha! You’ve inspired me to closely re-read Alton’s recipe, and give it another shot! Thank you for your great recipes, beautiful pictures, your dedication and inspiration!